Report Says Wal-Mart Hushed Bribery Campaign In Mexico : The Two-Way In a massive investigation, The New York Times reported Saturday that Wal-Mart Stores Inc. silenced a vast bribery effort carried out by top executives of its Mexican subsidiary in order to build stores across the country. A van covered by a mural sits parked outside a Walt-Mart Super Center in Mexico City. Wal-Mart Stores Inc. hushed up a vast bribery campaign that top executives of its Mexican subsidiary carried out to build stores across Mexico, according to a published report by the New York Times. In a massive investigation, The New York Times reported Saturday that Wal-Mart Stores Inc. silenced a vast bribery effort that top executives of Mexican subsidiary Wal-Mart de Mexico carried out in order to build stores across the country. 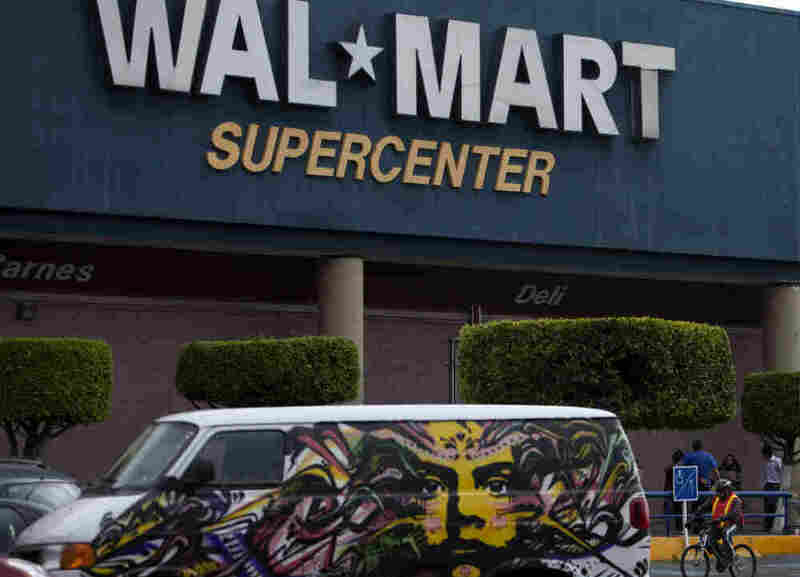 Wal-Mart dispatched investigators to Mexico City, and within days they unearthed evidence of widespread bribery. They found a paper trail of hundreds of suspect payments totaling more than $24 million. They also found documents showing that Wal-Mart de Mexico's top executives not only knew about the payments, but had taken steps to conceal them from Wal-Mart's headquarters in Bentonville, Ark. In a confidential report to his superiors, Wal-Mart's lead investigator, a former F.B.I. special agent, summed up their initial findings this way: "There is reasonable suspicion to believe that Mexican and USA laws have been violated." The rapid growth of Wal-Mart in Mexico is so much so that now one of every five Wal-Mart stores is in the country. The Mexican subsidiary was the company's brightest success story, pitched to investors as a model for future growth, according to the report. But then confronted with the evidence of corruption, the report alleges Wal-Mart executives were more concerned with damage control than rooting out the wrongdoing. The newspaper said that only after learning of its investigation did Wal-Mart inform the U.S. Justice Department in December 2011 that it had begun an internal investigation into possible violations of the Foreign Corrupt Practices Act. Under that law, it is illegal for U.S. corporations and their subsidiaries to bribe foreign officials. "If these allegations are true, it is not a reflection of who we are or what we stand for. We are deeply concerned by these allegations and are working aggressively to determine what happened." The company also said that it takes compliance with the law very seriously, and also noted that many of the "alleged activities" in the Times article occurred more than six years ago. The report goes on to detail a lengthy battle at the top levels of Wal-Mart that pitted the company's moral and ethical guidelines against its desire for rapid growth. Then-CEO H. Lee Scott Jr. reportedly rebuked internal investigators at one meeting for being overly aggressive. Shortly thereafter, the newspaper said, the investigation was turned over to the general counsel for Wal-Mart de Mexico, who himself was alleged to have authorized bribes. He swiftly exonerated his fellow executives.